With a Website Builder Business Plus plan, you can update your Twitter page to match your Website Builder design theme and business information. This does not affect any of your tweets — only the appearance of your Twitter page. In Website Builder's Dashboard tab, find the Social section in the right-hand column and click Connect or Create. At the bottom of the Preview Mode's Social tab, click Connect beneath the Twitter page preview. 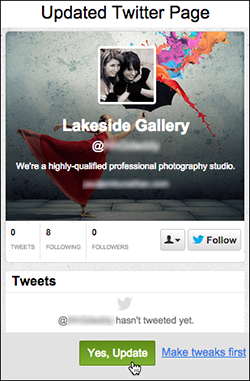 In Website Builder's Social Pages window, click I already have one. 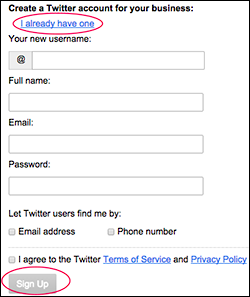 Note: If you don't have a Twitter account, complete the onscreen fields and checkboxes below I already have one, and click Sign Up. 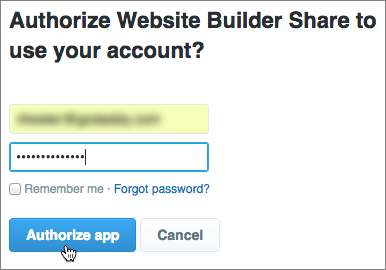 When Twitter asks if it's OK for Website Builder to share your account, enter your login information and click Authorize app. In Website Builder's Social Pages window, click Yes Update to save your Twitter page theme, or click Make tweaks first to make more changes. Note: After making your tweaks, click Save and you'll return to this page. When the Are You Sure page asks you reconfirm the updates, click OK. The Social Pages window will remind that you must publish your changes before they take effect, so click Publish at the top right of the Preview Mode's Social tab. Click Publish one more time in the Let's Publish window. Once the page is published, Website Builder displays a small confirmation window in the upper right. Note: Whenever you change your Website Builder theme or photos, you'll need to repeat these steps to update your Twitter page as well.